Zhone, one China of one Chinese.矢子家庭集。 : God kept me offline for 10 days, brings sally&me into echo. God kept me offline for 10 days, brings sally&me into echo. it has been more than 10 days since my Internet connection broke. in those days, i itching for surfing, for seamless webbing, but i had to live with God's setting to let me calm down, now that i also saw trifle online, esp. microblog portals domestically. when i was kept offline, i interacted with folks in my hometown village more, and surveyed more places around the village, including the road, school, field, closest neighbor village, Shanggui, whose residential long time dominated the cadre team of the local government. no doubt i shot more photos for villagers, for the history of the land my passed dad, God, owns, had to be reviewed and polished. in the process, i more and more felt the pains of missing my baby son, warrenzh, hope of China, who now under his mom, emakingir's custody. sometimes when i buzzed in, baby replied in weak voice, which let me more burnout, afraid he suffering missing me, his dad. God, Masheng accompanied me&talked more with me. i was brought the view on relation with my Guangdong girl, Sally. so recent days i tried to contact her, who just returned Shanghai for her graduation ceremony from Guangzhou, where she works. so many pleasure in exchange words with her on air or by sms, but our future still in molding in God's shine. i m quite sure she will become my second 4th wife, parallel with my Taiwan fiancee with whom i only met 2 times in Qiqihar, both with baby's companion. that's what God and Masheng assures me from the start back to my first hometown journey 2 years ago, when i first time asked her for marriage. Ok, its a sultry noon. i prepared blogging, including photos, since early morning. my keyboard turns sticky now. bye, all my beloved. bright belongs to us. i assert here i own the world from my ancestor and beyond. niece returned to Wuhan after a night at home.^prepared workspace before breakfast. invited visiting niece&her niece eating together. the little girl gamed since them, while i napped awhile. niece left&returned to Wuhan to join her college. God kills a baby girl in Zhudajiu.^read most day while attending d/l. napped awhile at noon when the evil back door neighbors babbled. then niece returned from Wuhan, before her 3rd year summer college vacation, enjoy snack she brought&rabbled. the granddaughter of elder brother returned from her kindergarten, gamed with a evil neighbor kid. i bathed before dinner. haunted outside, first chatted with the only taxi driver in Zhudajiu, then attracted by a vcd of local opera. when i stood on second floor of elder brother's house, a baby girl drown in her grandpa's indoor pool, which is the only case among villagers who has such a spacious yard. lingered some time with the doctor. continued to help niece claim her vanity url for her qq mail, blogµblog. talked to baby son on phone, alermed him&his mom the threat of drown, as well as other sinful murdering plot i sensed these days in Zhudajiu, the polluted land by historical wrong doings among villagers. let mother not to memorize ancestor with crackers&burning yellow paper.^today its lunar May 1st, lots of families in Zhudajiu held ceremony praying&memorizing their passed relatives as well as ancestors with kneels&crackers&burning yellow paper which regarded as money in the other world for their ancestors. i was woke by crackers everywhere&got annoyed. tried to got music online but again failed, likes the case of online radio i discussed it previously. in breakfast told mother give up traditional commemoration way, she nodded even reluctant. its a cloudy morning. benzrad朱本主子卓 (http://t.qq.com/bentchu) 转播: i agree. common Chinese half-disabled by constrained from gun while dog system like cops armed to teeth. people must be empowered anyway anytime. folks wondered me.^posting blog lasted after noon for likely blocking over some of my sites. near dinner let neighbor boy, a demon, played game on my notebook. haunted outside after rich dinner, frequented a cordial wife in the village. played with kids in front space. later revisited the wife whose family dining. lots of evil probings whipped in my mind before i worked in night. baby's mom, emakingir dined out with his colleagues, reluctant to go online, fine tuned family google knols till near 10pm. post a blog entry.^recent morning got up lately, likely worked too late in night, usually after 10pm before went to bad. prepared&post a blog to include tweets&photos, also a video of raining since breakfast. mother bought some litchi for me&quite sweet&juicy. its a sunny morning. A drizzle wrinkles on the surface of one of Zhudajiu's ponds. a bird rest on a power line support pole. 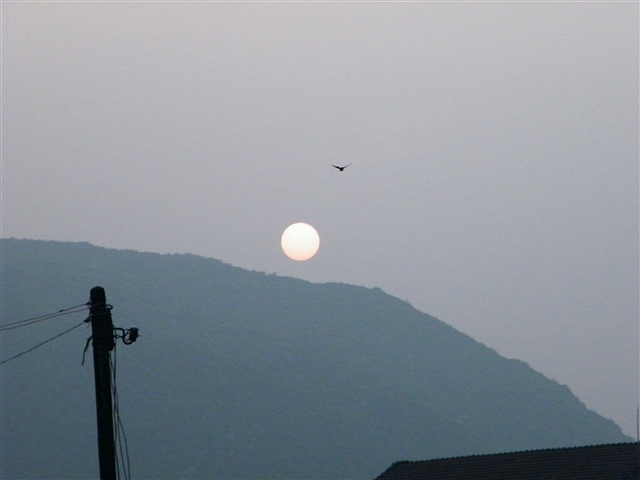 a sunset over Zhudajiu village. day offline, brewing love for southern girl. fighting for a responsible government lasting on. sunny days with lots of games. cloudy days, in want for the stuffy hard disk.